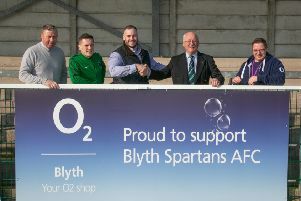 Two junior football teams in the Wansbeck area have received sponsorship from a charitable organisation. Ellington Juniors have two under eight sides who operate in the Pinpoint Junior League – the Eagles play in the Bravo division and the Hawks in the Foxtrot division. Recently they have worn new kit thanks to Bothal Masonic Lodge. Ian Forster from the organisation said: “This year we decided to look for other ways to help children in the community and it was suggested to look to sponsor a local junior football team. Derek Mole, also from Bothal Lodge and who presented the strips, said: “We are delighted to be involved and it was an honour to see how much the young players appreciated and respected their kit. "I hope we can continue this partnership into future seasons.” Paul Wake, treasurer of Ellington Football Club, said: “Although we are coming out of an economic downturn, companies are reluctant to sponsor youth football. "That is difficult for us as we need to get the kids new strips each year as they go through a lot of wear and tear during a season. "If we can't find sponsors, that cost has to be initially absorbed by the club and ultimately passed on to the parents. Over the past few years, Bothal Lodge has donated £6,000 to local schools in Ashington.